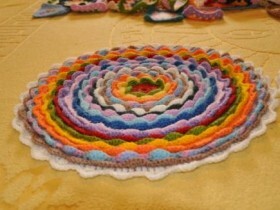 Crocheted with a hook allows you to create different masterpieces. With etoggo magic tool you can not only nice to dress up in their own hands by little things, but also to decorate and diversify the interior of their homes. 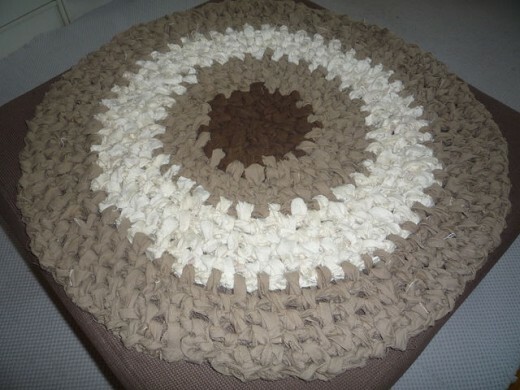 One such cozy interior and additions are knit crochet mats. And you can link them not only with special thread, but also from a variety of scrap materials, eg, of the remaining pieces of cloth or old things. The choice of thread, from which it is made crochet mats depends on in what room you want it to lay, and also on whether you want him to do just for beauty, thin or, so that it was warm. For thinner summer rugs, that you can not just lay on the floor, but also on the furniture, you can use yarn of pure cotton or mercerized, eg. Hook each case selected diameter twice as large, than the selected thread. To start knitting a dense mat hook his hands takes thick yarn, eg, polyester, wool or acrylic. Dense and voluminous mats are ideal for the bathroom or toilet. Such products are usually relatively quickly tally, It has been made of the bulk material. Consider a couple of fairly interesting examples. In order to obtain a dense mat take three coil and store them strands together and then knit a triple thread. At the beginning of each odd number of do not forget to do 3 air loop for lifting. 1p. Yellow thread in the third loop of several provyazyvaem 3 v s / n, Two loops are missing and then to 32 knitting loop repeat report: 3 PT / n in one loop, two skip loop, 3 v s / n, in the last loop of the chain provyazyvaem 1 v s / n.
2 p. Knit blue thread to the end of the series: 1 st no / n, two air loops, skip 3 loops and loops between the following provyazyvaem 1 st no / n.
3p. For this series taken a white thread. Each arc arc provyazyvaem 3 v s / n, series concludes provyazyvaniya 1 st s / n in the last loop. 4p White thread is changed to yellow, and a number of provyazyvaetsya as well as a second. 5p. In operation returns blue thread, and the third row provyazyvaem. 6p. Fit white thread, as the 2nd. 7p. Again the yellow yarn and knit as the number of third. After that, until the end of the work repeated rows from the 2nd to the 7th. All should get 43 a number or 130 see paintings. Completion of works is tying the mat on the edges of the two rows of white thread. The first row of columns is done without sc, and the second is knitted as follows: 1 st no / n, two loops of the previous row skip, 3 Article. s / n in one loop, miss two loops, and so is knitted to the end of the series. At the end of each row is necessary not to forget to do the connecting bar. If your house has accumulated a lot of multi-colored knitted linen or old things, do not rush to throw them out, as they may well get a second life and tie are nice rugs from scraps. 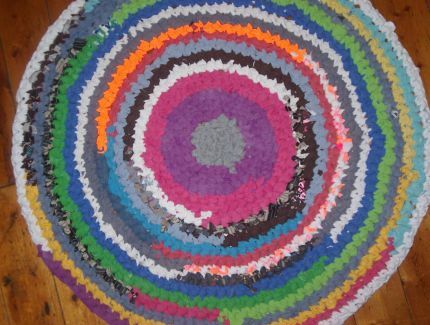 Mats of this material at hand, you can create different shapes and sizes, To do this, just turn a little to your imagination and have at least a little skill crochet. The beauty of these rugs also lies in the fact, that you can use for them any scraps of color and bind as the heart desires, and from this they will not lose its charm. Before any such knit mat material must be prepared for him. To do this, unnecessary little things are cut into long shreds, the width of which usually takes about three centimeters, They communicate between themselves and collapsed into glomeruli. Hook for it is also desirable to take twice as thick, prepared than the thread of loskutochkov. First row to get involved in each loop of two columns, without sc. Then, divide the circle into six parts, and in the last loop of each part doing the addition to 1 column with sc. In order to pad turned rovnenko, also need to remember to do the beginning of each series of round air loop for lifting, and at the end joining the ranks polustolbikom.